The principle of operation of a twin-circuit master cylinder is as follows: The pedal pushrod pushes the first piston, pressuring the first circuit. This pressure is equal throughout the system and not only operates the front brakes, but also pushes the second circuit’s piston forward in the master cylinder, operating the brakes of the second circuit. There is no physical connection between the pedal pushrod and the second piston. 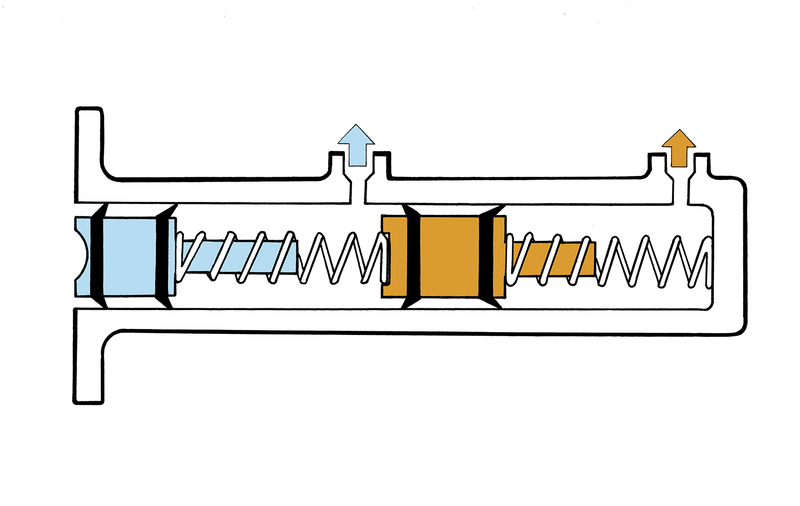 If you rebuild such a cylinder, note that the first seal of the second piston must face the first piston – that is, it’s the opposite way round to the other three seals. Surely the advantage of a twin circuit braking system is that a problem (loss of pressure) in one circuit has no effect on the other circuit. If there is no physical connection between the brake pedal and the second piston wouldn’t a total loss of pressure in the first circuit, a burst flexible hose for example, mean there is no pressure applied to the second circuit? Sorry if I’m missing something really obvious here!